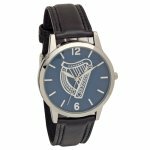 This wrist watch features a rich embossed Irish Harp pattern in Silver finish on the Dial with Black leather strap - low nickel. Case Size : 40mm, Band Width : 18mm. Each Harp Embossed Dial Wrist Watch will be packaged securely for posting.